No person shall be held to answer for a capital, or otherwise infamous crime, unless on a presentment or indictment of a grand jury, except in cases arising in the land or naval forces or in the militia, when in actual service in time of war or public danger; nor shall any person be subject for the same offense to be twice put in jeopardy of life or limb; nor shall be compelled in any criminal case to be a witness against himself, nor be deprived of life, liberty, or property, without due process of law; nor shall private property be taken for public use, without just compensation. 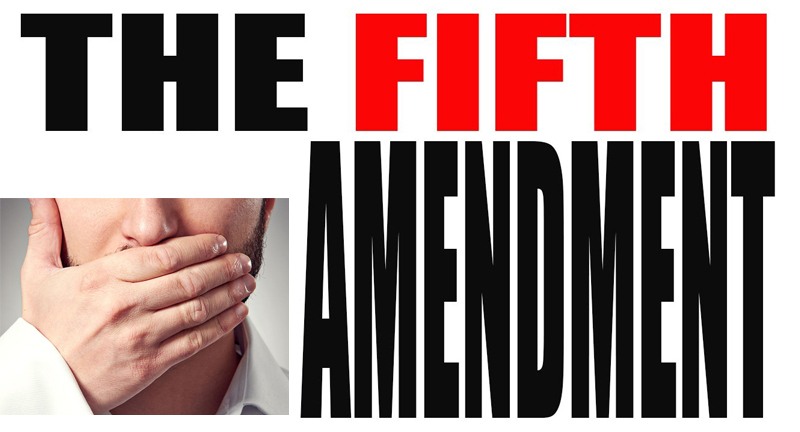 The Fifth Amendment to the United States Constitution guarantees the right to certain protections; the protection that has been in focus as far as offshore bank accounts and overseas assets are concerned is the ‘protection from self-incrimination’. The Bank Secrecy Act of 1970 that regulates offshore banking, and identifies as its purpose ‘to require certain reports or records where they have a high degree of usefulness in criminal, tax, or regulatory investigations or proceedings.’ 31 U.S.C. §5311. U.S. Treasury Regulations promulgated under Section 241(a) of the Bank Secrecy Act requires U.S. citizens, Permanent Residents (Green Card Holders) and certain other foreign nationals residing in the U.S. to keep records and file reports by June 15th of each calendar year of their foreign financial transactions and relationships. U.S. Citizens and Permanent Residents with foreign bank accounts must disclose their foreign bank accounts by filing Form TD F 90-22.1, Report of Foreign Bank and Financial Accounts (FBAR) each year that it is applicable in their particular situation. Certain dollar limits apply to each account but aggregation rules apply to multiple accounts that could reach the $10,000 account balance reporting threshold. This required report is commonly called the (FBAR). C.F. R. §1010,350. The reporting rules apply no matter where the U.S. citizen or Permanent Resident happens to reside in the world. In other words, the U.S. citizen or Permanent Resident does not have to be physically in the United States at any time during the tax period in order for them to be required to file an FBAR if the citizen or permanent resident owns or otherwise have a financial interest in, or has signatory authority over offshore accounts. Moreover, foreign assets records must be maintained for at least five years, and must be available for inspection pursuant to C.F.R. §1010.420. Failure to timely file an FBAR is a felony under 31 U.S.C. §5322. The United States Supreme Court created The Required Records Exception to the Fifth Amendment’s protection from self –incrimination in 1948 in Shapiro v United States, 335 U.S. 1, which basically prevents individuals who possess records the Government requires them to maintain as a result of voluntary participation in certain regulated activities from asserting their Fifth Amendment privilege against self-incrimination. The U.S. Treasury shares the information it collects pursuant to the BAS’s record-keeping and reporting requirements with a number of other governmental agencies. This data sharing is designed to serve important public purposes sufficient to imbue otherwise private foreign bank account records with “public aspects” satisfying the BSA’s third prong. Taxpayers have lost in the United States Court of Appeals for the 5th, 6th, 7th, 9th Circuits where the Courts have considered and upheld the IRS’ position on disclosure of offshore accounts under the Bank Secrecy Act of 1970. As of this blog, we are not aware of any circuit courts (or any district courts) who have ruled in the taxpayers’ favor with respect to The Required Records Doctrine as it relates to offshore assets held by U.S. persons; which includes U.S. citizens, resident aliens, trusts, estates, and domestic entities that have an interest in foreign financial accounts and meet the FBAR reporting threshold. Currently the IRS is administering several amnesty programs designed to help taxpayers who are in non-compliance of the BSA with respect to delinquent FBAR filings and for taxpayers with Foreign Account Tax Compliance Act, enacted in 2010 (FATCA) tax compliance problems. On a related note, Foreign Financial Institutions (FFIs) from around the world are currently gathering account holders information from account holders under FFI Agreements and Intergovernmental Agreements negotiated over the years with the U.S. Treasury in implementation of FATCA, and will soon begin turning this foreign account holders information over to the IRS either directly or indirectly. Non-compliance with the BSA and FATCA are covered under IRS amnesty programs that have strict qualifying guidelines, procedures, and penalty structures built within them. These programs could be modified or eliminated at any time. This entry was posted in Offshore Assets and Accounts Disclosure on November 27, 2014 by Coleman Jackson. 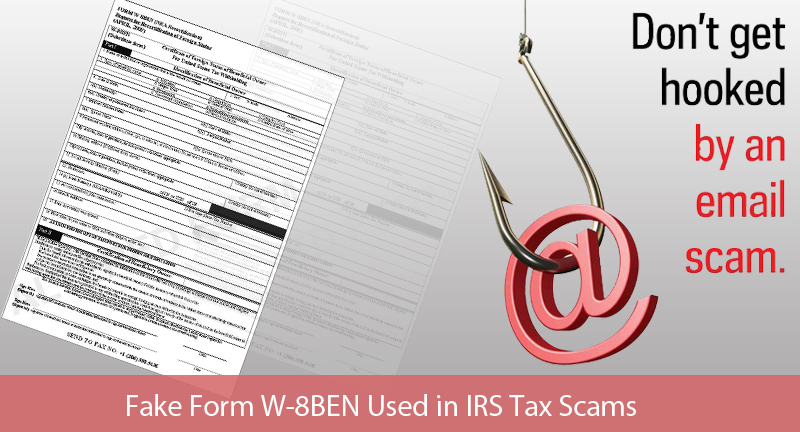 Fake Form W-8BEN Used in IRS Tax Scams, Don’t Get Hooked! The Form W-8BEN (Certificate of Foreign Status of Beneficial Owner for United States Tax Withholding) is a legitimate U.S. tax exemption document. You can only submit Form W-8BEN directly to your withholding agent. How IRS Form W-8BEN Scammers target taxpayers? Scammers usually target taxpayers who either did not or were not able to timely file their tax statements before the April 15th deadline. IRS Form W-8BEN Scammer’s typically send out scam mails (email, postal service mail, facsimiles, etc.) to acquire taxpayer’s personal information. IRS Form W-8BEN Scammers will typically target non-resident aliens residing in the United States since they are the taxpayers who are likely to file a “Certificate of Foreign Status of Beneficial Owner for United States Tax Withholding.” Many Americans who were born in the United States does not have any ownership interest, signatory authority, beneficiary interest or other controlling interest in any offshore accounts or overseas assets. The Form W-8BEN Scammer send altered versions of the FORM W-8BEN asking a number of personal inquiries that are NOT needed for the real form (for instance mother’s maiden name, passport number, date of birth, PIN numbers and passcodes). The legitimate IRS Form W-8BEN does not ask for any of that information. Following screenshot shows both altered form (first) and original form (second). How Non-Resident Immigrants Can Protect Themselves From IRS W-8BEN Scammers? Attachments may contain malicious code that will infect your computer, smart phone, smart television, or tablet. If you clicked on links in a suspicious email or phishing website and entered confidential information, visit IRS’s identity protection page. This entry was posted in IRS Problems on November 14, 2014 by Coleman Jackson.